10262 Aston Martin DB5 revealed! 10262 James Bond Aston Martin DB5, 1,290 pieces. 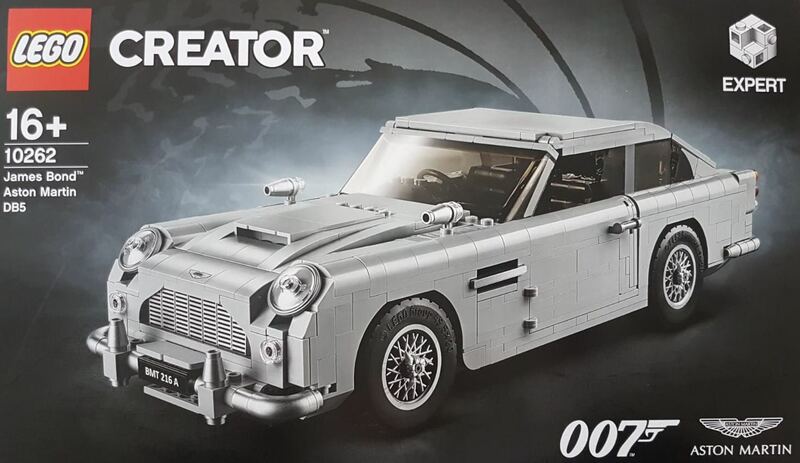 Uncover the secrets of 007’s most famous vehicle with the LEGO Creator Expert James Bond Aston Martin DB5! Combining a wealth of sophisticated gadgetry and the elegance of 007’s iconic Aston Martin DB5, LEGO Group have today announced the launch of the LEGO Creator Expert James Bond Aston Martin DB5, available exclusively from LEGO Stores and shop.LEGO.com from today. James Bond’s Aston Martin DB5 from the 1964 hit film Goldfinger is the latest in the LEGO Creator Expert series and features a wealth of authentic gadgets and gizmos all created in Q’s workshop. The model has been designed to provide a challenging and rewarding building experience full of nostalgia—a must-have for fans of Aston Martin, James Bond movies and LEGO building sets. 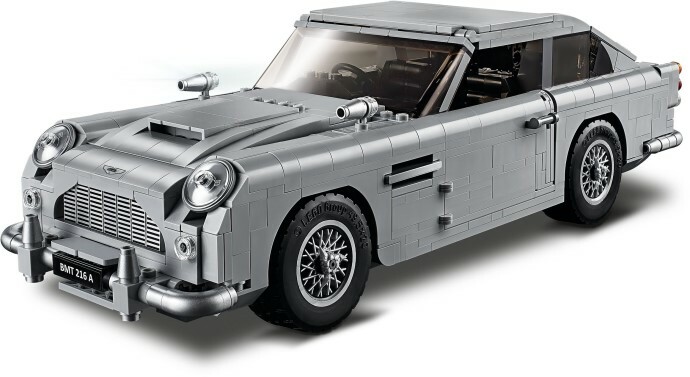 Featuring 1,290 pieces, you can combine the understated sophistication of Aston Martin with the joy of LEGO building and create your very own piece of James Bond memorabilia. An authentic replica of the world-famous 1964 Aston Martin DB5 sports car, this 1:8 scale model includes many of the unique features showcased in Goldfinger, from a working ejector seat, revolving number plates, radar tracker, hidden telephone, bulletproof shield, front wing machine guns and wheel mounted tyre scythes’. The exterior of the car, painted in Silver Birch just like the original, features the smooth curves and sleek edges of the original Aston Martin DB5 and includes key details including sloped headlamps and drum lacquered silver front and rear bumpers. The moulded silver wire wheel rim inserts also feature the iconic Aston Martin wings that match the wings on the front and rear of the car. Pop open the bonnet to find a detailed six cylinder engine and open the doors of the car to reveal a radar tracker, as well as a telephone tucked away in the secret door compartment. This LEGO Creator Expert model packed with a wealth of James Bond gadgetry is sure to have fans rubbing their hands with excitement. The finished model measures over 3” (10cm) high, 13” (34cm) long and 4” (12cm) wide, making this a perfect display piece whilst showcasing the timeless elegance of 007’s iconic sports car. You'll find a few more pictures on the set details page and more pictures from today's event on our Twitter feed. We'll be publishing our review in about 15 minutes! I like this new take on the themed Creator vehicles. I hope they continue with it. Can't wait to see Magnum P.I. 's Ferrari with Hawaiian shirt folded in the passenger seat and optional bulletholes. Can't say I'm impressed... And that pricetag, far too much!!! Looks terrible and it is expensive. Give me a BTTF time machine! Got to say it looks too angular and “blocky”. Yes I realise it is Lego and they have tried but it is to square for my liking. I just can't get excited over this car. With all the gadgets it has so much potential but ultimately the looks are what matter to me and it just looks...off. No matter from what side you're approaching the car it's just not right. Such a shame because the gadgets seem fun. "The exterior of the car, painted in Silver Birch just like the original". I think there's a reason they don't show the actual car on the box, because it doesn't really look like it all that much. They've taken something cool and sleek and made it look like a box. Is it a sticker that they have used to try to make the side rear window look curved? It's a real achievement to take one of the most beautiful cars ever made and make a model so ugly. Does Lego have no quality control? Quote: "The exterior of the car, painted in Silver Birch just like the original..."
Strange, looks light bluish grey to me. And to be honest, as this is rumored to be 150 Euro, it looks like really bad value. Compare the VW Camper Van, which has even more pieces, just as many functions, and is just 100 Euro. IF the parts that are LBG had been in drum laquered silver, and those that actually ARE drum laquered silver had been chrome, that would have been really something. As it stands this is just an overpriced grey car, which doesn't even capture the beautiful shapes of the original very well. The proportions are off somehow, and especially the front looks nothing like the real DB5. A fact that is made even more obvious by them showing off the real car at the event. I kinda love it and hate it all at the same time, need to see it in person before I can make up my mind. Horrific. Truly horrific. Clearly the pursuit of ugly has spread from Technic (Porsche, Bugatti) and is now a company-wide thing. Another lump of grey plastic from Lego. We already have enough grey vehicles in the Star Wars range. Couldn’t they have picked another car in a different colour? Or maybe this is the start of a series of these... awful. Now, never try and reveal a set on the same day it releases ever again. Just... stop doing it. Surely it's not 1:8 scale ? The GT3 RS and Chiron are 1:8, I guess it should be 1:18. This has all the ingredients...one of the world's most famous classic cars and one of the world's best known literary figures. Add in all the gadgets and wrap it up in a stylish parcel... and you should have all the ingredients you need for something special. Yet, somehow, the end result just doesn't reflect this. What a shame. See the colour scheme is fine for me. I'm not a Star Wars collector so having one grey vehicle alongside the 6 other colourful ones on my Creator Expert vehicles (plus Caterham) shelf is fine. Indeed as a Lego car, it's passable. A bit flat on the sides, but not a big deal. But as an attempt at replicating the real thing - just woeful. They've clearly put far too much effort into play features and nowhere near enough into the aesthetics, which considering for most people it's going to be a display piece is completely the wrong move. Even little things like the box, which generally looks fairly classy, has thumb tabs so it'll be destroyed in no time. And £130? Wow. No idea where they pulled that figure from but it's a big fat thumbs down from me. Looks a bit better than in the leaked images, and the gadgets seem cool, but the price is horrible. Hahahhaa, the price equals to $220 in Norway. I spend alot of money on Lego, but $220 for THIS?! NOOOO! I like it. The one major issue I see is that the front end doesn't have that curvature to it, but I'm not really sure how that could have been accomplished either. That price though... Easily about $20 too high for me. $150 for less than 1300 almost entirely all grey pieces... I’m good, thanks. Simply terrible. Way too blocky, looks more like a Trabant than a DB5. This is sad since the F40 was soo well designed... Also, the price of this shoe box must be a joke. Looks bad and has a ¨way too high price. Huh, I'm generally not into vehicles with LEGO, but I actually love this set. I think it looks amazing, and all the hidden tricks are cool. Interesting that it seems unpopular with the actual target audience. Maybe because I'm not familiar with the real life car, I'm not interested in comparing it to the original, just evaluating it as a LEGO set in absolute terms. I have never seen any bond films but looking up the actual car compared to the model I honestly don't think they did too bad! Maybe it's just me lol. I'm trying to figure out why the set is $150. Is it because they needed to get two licenses? Or is it just because LEGO knows they can? The London Bus cost $10 less and has 400 more pieces. The Beetle has 125 less pieces and cost $50 (A THIRD!) less! For $20 more you can get a 1,000 more pieces and minifigures with the Modular range. If the model was not supposed to represent a particular car (and a beautiful one at that), and if it was $40 or so less, it would be interesting. The description in the release that states “...features the smooth curves and sleek edges of the original Aston Martin DB5...” is borderline delusional. That written, the most amazing aspect to me is the inclusion of “front wing machine guns.” Does TLG reconcile this with their long-standing ban on modern weaponry by classifying Bond as fantasy? Or is it symptomatic of a change in philosophy? Why does anyone even bother complaining about how this looks? Do you think you'll magically change it or TLG will hear your gripes and fix it right away? (Rhetorical questions; do not answer). No thanks. Even as a longtime Bond fan, I'm going to have to pass on this one. There's unfortunately nothing in this that interests me. If it'd been a playset, with a scene including the DB5, then I'd probably be a lot more likely to get that. YOU MEAN IT DOESN'T COME WITH A FIGURE??? Wow. The hate for this is incredible! Should be easy to get hold of one then!! Well, I was looking forward to this, but that is one ugly looking model of the DB5! Will give this one a miss. Agreed with many above...I wouldn't purchase one for more than $100, and even that is questionable. Flat or metallic silver or nothing. I am the minority who really likes it and can’t wait. Guess licensing must explain a lot of the extra perceived price. ^ You can add sticker shock to that. I like all the feature and gadgets BUT, the shaping still isn't right. Those beautiful rounded edges of the Aston Martin isn't here. Too flat. It's nice, don't get me wrong. I'll want to buy it 'cause I'm a big 007 fan but the shaping. There's a Mega Blocks WWII plane that uses the rounded edges to get proper shaping and there, (maybe) they needed to scale up a bit and get those curves in there? Not sure. This reminds me of the 10252 Beetle. That didn't feel/look like a VW Beetle. Too flat, no roundness which is the signature of the car. These models both look nice, excellent builds and fun features but doensn't capture the look of the actual vehicle enough. I understand the limitations the designers gotta' go through but it needs the roundness or fabricate new elements to get some of these shapes better. IMHO. The DB5 was also unveiled at 10:07 this morning in the Glasgow brand store so presumably unveiled in all the brand stores today. Glasgow also had the licences. This has to be one of the most well built Creator Expert cars. Instantly recognizable and the front grille is absolutely perfect. Love that they got all the main gadgets in there. Ah! Even the little red button. "What ever you do, don't push it "
Is that the first set with the console on the right side? Who cares about the price? It’s Bond, James Bond. Will look great with my Mini, F40, Le Mans car and yes my Chiron. So I'm not the only one who thinks this is fugly? Phew!!! To think that I was worried about logging in this morning to rapturous applause in the comments. I don't even like James Bond that much and for $209AUD, no freaking way! @Isaac The Animator The Mini Cooper and London Bus are RHD. I am also not a very big fan of this particular set, but like many have said, considering the limitations of the medium and the amount of features included, it might have been about as good as it could have gotten. The only thing I really dislike - licences notwithstanding - is the price. Then again, there will always be discounts to be had someday. In the end, I am certain I will add this to my collection. It just isn't a day one purchase for me, even though I am a huge James Bond fan and Goldfinger is my favorite movie in the series. My favorite Creator Expert car to date remains the Mini, another British car icon. Oh dear. At least the colour matches the dust it will collect. Given the choice, I’d choose 3263 over this as it matches the source material far more accurately. I'm just laughing at all the idiots on this site who clearly thought they were getting a Revell kit or something. It's a Lego car, and as such, it's about as accurate as you are ever going to get, not to mention achieving the holy grail of Lego design, with seamless functions incorporated undetectably. Mike Psiaki has pulled out all the stops for this one. As to price, unlike most creator cars, this one has two separate licenses, one for Aston Martin, and one for the IP holder of the Bond films, whereas the London bus is unlicensed. DB5 also has new parts, part re-colours and technic elements. Also, unlike some MOC's held together by illegal connections and hope, this set is built to Lego product standards and is actually quite sturdy. As for calls for it to have been made in pearl silver, as good as that would have been, it was never going to happen. That would have meant that pretty much every piece in the set was a re-colour, and TLG would never sign off on that. "To those who complain that it an ugly grey lump, well yes, but so is the original DB5"
Hearing this, I would almost like to cry "sacrilege". If this were Life of Brian, I would scream for the immediate stoning of @Privatematrix. Serious........ € 169,99 in the Netherlands. Are the parts made from original Sterling Silver??? The car from Goldfinger......... costs you a golden fortune. I love the DB5. The set is a bit blocky, but so it the real thing. Nice review of the set! It's appearance did not meet my expectations. Also it's a bit overpriced, but I still think it's a neat product. I'm just sorry about that comment section. The brickset team does a wonderful of job with their reviews and articles. I am thankful to see their opinions even if I don't always agree. I LOVE IT! I did have slight reservations after the first look, but after watching the videos and seeing other pictures and reviews I think its a master piece of work. I have just ordered mine and I can't wait to display it alongside my Creator Expert Bus, Beetle, Camper Van, Mini, Ferrari and the Ideas Caterham. One more thought drives me: For that price of 150€, would it dare to ask, why not produced new parts for a well shaped top (panoramic window), instead to apply sticker tricks to conceal inappropriate parts. That would really expand the secret agent range. When I heard the announcement of a Lego James Bond car I was really hoping it'd be the white Lotus Esprit with fold out fins and retracting wheels (somehow if it were possible?). After seeing this Creator Expert DB5 I'm *really* wishing it had been the Lotus... Oh well. im commenting here as the comments have been disabled on the other page. I'm getting a bit fed up of reading all the bickering on this site. I actually like the set and bought one on the day of release. it looks a LOT better in the flesh than the pictures and I'd recommend the set for what it's worth. thanks for the review guys and keep up the good work. This is a joke, right? Lego revealed version 0.2 instead of the final version and is having a late april fools day. Hard to believe that the designer of this set has made such wonderful sets in the past. Ah well, win some, lose some. To say this thing looks blocky, breaths new life into the concept of understatement. Headlights: way too tilted backwards to even resemble the real thing. A 2 year old could have spotted that one. A sticker for the curvy window is the least of its problems. How about that nose... the car seems to be screaming in pain or horror (probably after hearing the pricetag it was getting). It surprises me that the designer uses so little of the new parts. It is a difficult car to capture in Lego, but if you can’t do better than this, somebody at Lego should have had the courage to pull the plug on this one. The features are nice but I don’t think this will save the car from becoming a bit a of sales disappointment. I looked forward to this model, but have removed it from my wanted list. About the critique this model gets and the people that seem to have a problem with people disliking it and offcourse pulling the old “don’t like it, don’t buy it”-card: take a look at other Lego sites and find out this set is highly disliked by many fans. So get a grip if people trigger you with a different opinion. At least debate with them, both likers and dislikers could learn from this. It’s not like Brickset recommended this set. Hopefully, this set will be a sales flop and Lego will learn from this abomination that they need to pay more attention to how the model looks. I completely disagree with those who give Lego a pass with the "limitations of lego " as an excuse as to how poorly executed the design team did in trying to capture the look of the DB5, as we have seen other Lego products which have done a much better job in representing its subject matter. I for one will only be buying one if they discount it to maybe $10.00. 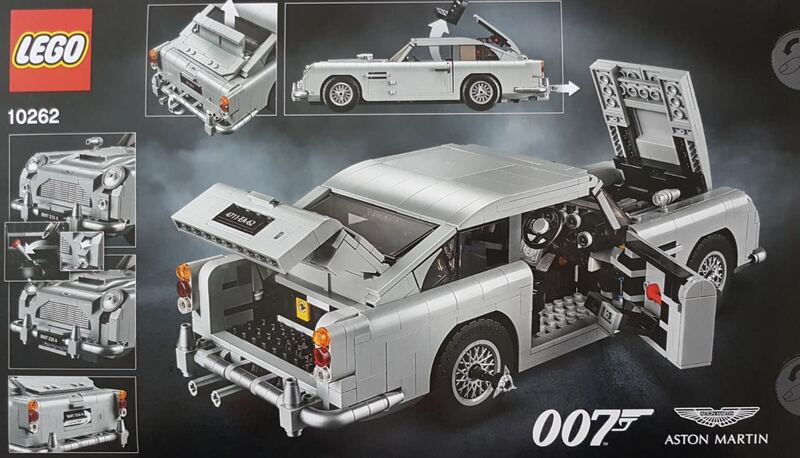 As an avid 007 and Lego fan, I am extremely disappointed is this sadly lacking, poorly executed set. It's a cool car and i will get it, but i'm quite dismayed that we have to pay 170 for this here in the Netherlands, 20 more than the mentioned EU price. While i've gotten used to having to dock an additional 10 on everything, this is just ridiculous. I quite like it. Pretty cool they went with all these options to make it a proper bond-car. I've just recently built the Ferrari and was quite impressed with the building techniques so looking forward to get htis one too. Price is a quite steep, but I get that there is 2 licencing things instead of just the one. And I'm guessing Bond is expensive. Thanks to capnrex for getting a review out so quickly on the day of release. I'll need to wait for a discount on this and Harry Potter takes priority, but it's definilty going on the want-list. Of course everyone is entitled to an opinion, but some really silly comments here about it's looks. People it's made of Lego. Personally i think its great, expensive yes, but great. I love the "It's made out of Lego" comments. So is the Saturn V, which does a FAR better job replicating its source material - and that was originally a fan design! I really like it but I think 100€ would have been nice, 120€ reasonable. 150€ is just too much. We should thank LEGO for this set, not because it's great and well priced, it's a POS and one of the worst priced sets ever made. We should thank them for making a set so bad that 90% of the LEGO Community agrees on something, that it's awful. So thank you LEGO. 60132 isn't a bad set at all, just $30 overpriced. This and the Hoth 'Assault' sets are the least liked in the last decade. I have to admit this looks terrible, its meant to be a curvy car, I mean look at the stuff some of the AFOL community come up with... I'm normally positive about most Lego sets but this looks like a lazy effort and missed opportunity from Lego.